When searching for a new home, surveys have shown that homebuyers mostly focus on the kitchen and the master suite. Because the master suite is in the spotlight, home sellers tend to upgrade this room while forgetting about the others. However, chances are, if a homebuyer purchases a home with multiple spare bedrooms, it’s because they plan to fill them. Instead of only focusing on the suite, make sure all the bedrooms are staged to sell. Even if you use a room for storage, clean it up for a sell. The potential buyers need to visualize the positive features of a room in order to imagine living in it. If they view a picture that looks messy and cluttered, that’s what they’ll imagine living in. That’s not a positive view to walk away with. If you’re repainting the master suite, repaint the spare bedrooms. If you update the master suite flooring, update the spare bedroom flooring. If you add a ceiling fan to the master suite, consider adding fans to all of the bedrooms. Try to keep each room as equal as possible. If a spare room currently contains no furniture, check out local garage sales, flea markets or thrift stores for some affordable items. You don’t have to break the bank to make a room look good. You just need to make it appear livable and cozy. 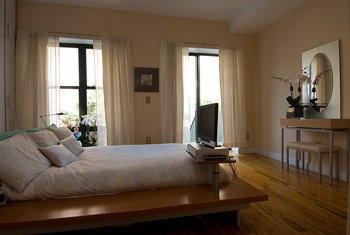 If the room looks drab, move some furniture from another room into the spare bedroom. Add some brightly colored accessories to make the room look inviting. Don’t cover the windows with unnecessary clutter. If the room is used as an office, a toy room or anything that indicates possible disorder, tidy the room up before showing the house. If used as a bedroom, keep the bed made and de-clutter the closet. Allow the room to appear as neat as possible. Spare bedrooms tend to show off custom décor that may not fit every personality type. If one bedroom displays Hello Kitty wallpaper and the other displays a mural of planets and rocket ships, you might find excited kids that love the themes, or teenagers who are less than thrilled. Your best bet is to offer to paint the rooms neutral at the buyer’s request. If you’re not sure what to do with an empty room, here are a dozen ideas from a past Buy Owner blog. A wise woman once said, “Don’t get me a diamond . . . get me a really big closet.” According to census data, Americans buy about 75% more clothes now than they did 10 years ago—a fact that has influenced designers, homebuilders and organizational gurus alike. These days, a closet is more than just storage space; it is an expression of personal taste and style. Many homeowners are dreaming big and reaching for the brass ring: a custom built-in organizational system. 1. Let your clothes dictate your storage system. Assess what type of clothes you have and how much space each item really needs. While you’re in an organizational mood, consider sorting your clothes by type and color. This will give you a whole new perspective on your wardrobe. 2. Consider all the tools and options available. Slanted shoe shelves with fencing maximize visibility, while keeping your designer treasures organized. For smaller shoe collections, consider divider systems or cubbies that can be customized to fit your shoe size. If space permits, think about adding glass-front doors. This allows you to view your clothes without subjecting them to dust and other harmful debris. Consider a double-hung closet. It is a great way to make the most of a small space. If you have a particularly large wardrobe, you might want to invest in a freestanding organizational system. Unlike typical systems that fit in your closet, these immense creations can be as large or as intricate as you want. Recessed lights are a great way to highlight shelves, drawers and other niches. A valet rod is perfect for hanging tomorrow’s clothes or helping you put together an outfit. Purchase high-quality wooden hangers that won’t stretch, distress or destroy your clothes. If you are lucky enough to have the extra space, consider adding a dressing table or a small sitting area. Consider adding your own conveyor system, which offers accessible at the push of a button. 3. Let your personal decorating choices shine through. Add decorative molding or designer handles to customize your organizational system, and choose fixtures and materials that appeal to your sense of style. 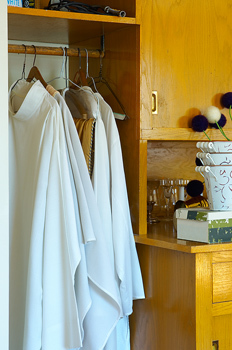 Don’t keep your closet masterpiece hidden behind a plain, six-panel door. Consider getting rid of your closet door altogether and letting the whole world see your newly organized space. Place rarely used items on higher shelves to maximize efficiency. Invest in adjustable shelves that can adapt as your wardrobe changes. Drawers are ideal for storing personal items and other unmentionables that you do not want displayed. Separate organizational systems are also available for your drawers. Compartmentalization adds a touch of sophistication to your closet and often means more space for your clothes.